Coquina Beach on Anna Maria Island has the best island beach sand in the United States and the fifth-best in the world, according to the Conde Nast Traveler. "Coquina Beach, on the southern end of Anna Maria Island, is the opposite of South Beach: It’s laid-back, bordered by towering pines, and boasts perfect, unspoiled sand as fine as powder," the website said. "It’s also the longest stretch of sand on Anna Maria — uninterrupted, but for remnants of old piers jutting out into the water." Here's the complete "Top 10 Island Beaches for Perfect Sand:"
1. Whitehaven Beach, Whitsunday Island, Australia. 2. Cayo de Agua, Los Roques, Venezuela. 4. White Beach, Boracay, Phillippines. 5. 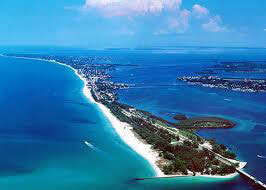 Coquina Beach, Anna Maria Island. 6. Shoal Bay East, Anguilla. 7. Vamizi Beach, Quirimbas Archipelago, Mozambique. 8. Kaihalulu Beach, Maui, Hawaii. 9. Playa Falmenco, Culebra, Puerto Rico. 10. Playa Negrita, Vieques, Puerto Rico. Anna Maria Island Trolley is a great way to get to your favorite places on Anna Maria Island and the best part is that it’s FREE!!! 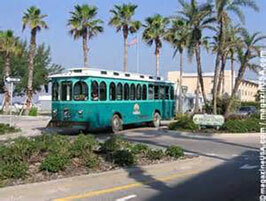 The Trolleys offer both air conditioned and open-air seating for whatever mood you are in that day, and service runs from 6 a.m. to 10:30 p.m. about every 20 minutes from the north end of Anna Maria Island at Anna Maria City Pier south to Coquina Beach, in Bradenton Beach. Â© 2011. All Rights Reserved.